Are you looking for help teaching yourself piano? Don't have time for regular piano lessons? eMedia Piano and Keyboard Method might be a solution also for you! 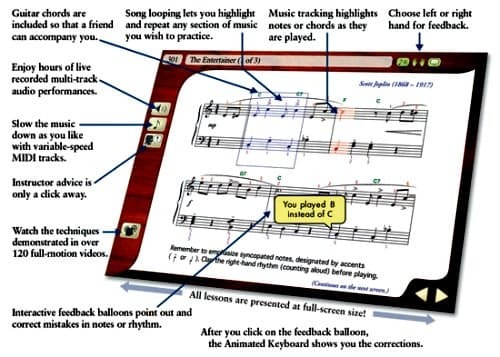 I have tried and tested several software packages for learning piano to use with my students. Emedia Piano and Keyboard Method is a very affordable piano learning software I recommend for adult beginners, that I also use in my studio. Here is my review to help you decide if this might be useful also for you! What is eMedia Piano and Keyboard Method? 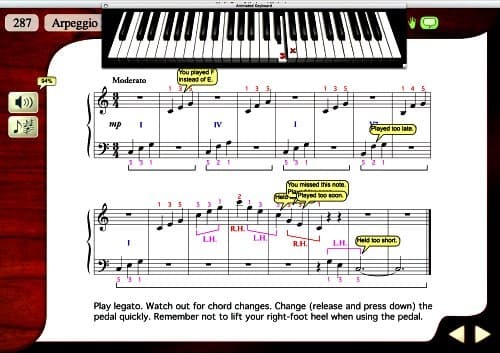 Emedia piano and keyboard method is a piano learning software with step by step piano lessons that will help you get playing with both hands and reading notes in quite a short time. It gives you a first introduction to how to play the piano, and plenty of varied interactive lessons. Do You Need an Acoustic or a Digital Piano to Use This Software? Although it is fine to use the software if you have an acoustic piano, you can, if you like, connect it to your electronic piano keyboard or digital piano so that you can get instant feedback just how accurate you play. If you do, it will show you if you played the wrong note, on time or if you were a bit late immediately after you played. What I like about the eMedia Piano and Keyboard Method is that each melody has accompaniment if you choose it. Of course it is a midi file so depending on your sound card, the sound can be a bit «plastic». But still it’s a fun thing to have as you play along! I discovered by accident that if you right click, hold down and select (like highlighting), a part of the staff, you get a blue square around it. Then when you listen and play along with the melody or accompaniment, it loops over and over that same section only. This is terrific if you need to practice one section a bit extra and not the whole piece from the beginning. So just select a part that you have difficulties with, and it will loop again and again while you play along until you really can play it! The piano accompaniment has a controller with which you can change the speed, so you can play it as slow or fast as you want, which is another great feature. In between the lessons there are small interactive ear training exercises that are great. You will practice to hear if the melody moves up or down, steps and skips and such. A simple but effective way of mixing in some ear training too. Does eMedia Piano and Keyboard Method Work? I find that after just a few lessons, you play and read notes pretty comfortably. With just a little time each day you can actually learn to play the piano and read notes. So all in all, the course is easy to use, and a good introduction to piano playing and note reading. The cons are that I find that although many lessons have a video that shows different aspects of playing with a nice piano teacher showing how to do it, basic piano technique is not well represented at all. For example the lesson about the correct hand position shows the fingers to be a bit «over curved», and the hand doesn’t look relaxed. This would need to be explained more to avoid tension. I would have liked to see more examples in the videos about basic arm and hand movements, how to press down the notes first non-legato then legato, arm weight, wrist movement, weight transfer and so on. This is very important basic technique to learn early so students don’t develop bad habits from the start. For a price that is less than two regular piano lessons, with eMedia's Piano and Keyboard Method for Beginners you actually get to learn from scratch how to read notes, play with both hands some well-known pieces, and there is even some chord piano practice with basic chords. You will learn simplified arrangements like Bach’s Minuet in G, The Entertainer by Scott Joplin, Brahms’ Lullaby, and many more well-known pieces. The course finishes with a ‘tour’ in different styles from Baroque to Jazz, with small simple arrangements that are easy to play and sound really great. I find eMedia Piano and Keyboard Method is good quality piano learning software at a very affordable price. and get 10% OFF + Free Shipping (Continental USA only) on Your Purchase at eMediaMusic.com.